My son, Alessio, was showing signs of trouble - acting out at home, not wanting to go to pre-school, and being extra sensitive. When he asked for a new pair of shoes so he wouldn’t “trip” on the playground, I pressed him on what was wrong. He burst into tears. Boys kept pushing him down at playtime. He was afraid to go to school. Alessio isn’t even four yet. I never expected that children that small would have the same kind of issues as many older kids. Bullying is starting younger these days. By the time a child is five, they have seen thousands of violent or aggressive images. But they are too young to understand and sort out the confusing messages, and will often imitate what they have seen. It’s our job as parents to actively monitor input, and also guide our children into becoming the kind of people we want them to be. Much of a child’s personality is formed by age five. The earlier we start teaching empathy, kindness and courage, the more these habits will become part of our children’s every day way of being. 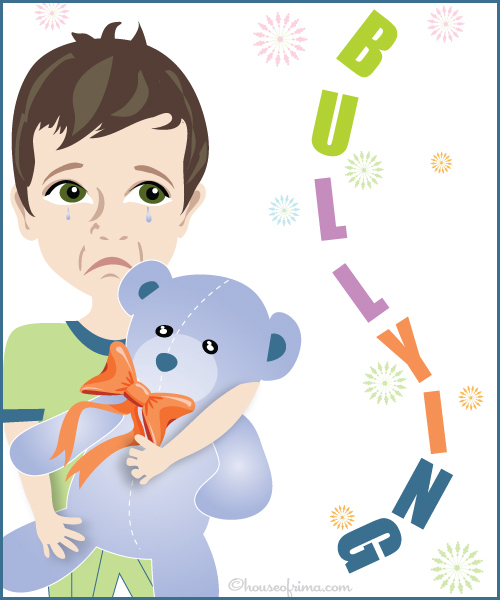 About 17% of kids are bullies, but bullying incidents happen to over 50% of children. A bully is usually a scared person with underdeveloped verbal and social skills. Okay, tiger moms, it’s easy to get mad at a bully, but keep in mind these kids need help too. By teaching your child to stand up to bullies, you are also teaching the bully that mean behavior won’t be tolerated. Hopefully the bully will think twice next time he or she is tempted to go rogue. Bullies tend to target those who are vulnerable, so the first thing to teach your children is to be assertive in the face of a bully. Most children who tolerate bullies will find themselves the target of that bully over and over again. Yet 57% of bullying incidents stop within 10 seconds of being called out. Teaching self-assertion and impulse control to younger children can be a challenge. If your child is having bullying problems at school or on the playground, try a few practice sessions together in a safe environment (where you play the bully, and your child the hero), using the following Bully Stand Down techniques. Stay calm. Crying or whining encourages the bully to continue. Teach your little one to take deep breaths, acknowledge and move through the fear, and calmly walk away. Stand up for yourself and for others, too. If you see a bully hurting someone else, say something or report it to an adult. Here’s where being a tattletale is an act of courage. Bullies want their targets to stay isolated and afraid to take any action. By telling on a bully, you are showing that kindness matters and empathy is important. Pay attention to the signals your child is sending. He or she may be too embarrassed or confused to tell you what is happening. Create a safe emotional space by listening and helping them understand their feelings. Talk to your child’s teacher or the playground supervisor, especially if there are ongoing incidents. Ask what you can do to help the situation. A friendly chat with the other parent about the issues your children are having together can be helpful to both sides. When children see their parents getting along, it sets a good behavior model for the children to try to work things out. Talk to your child about the qualities to look for in good friends, and how to be a good friend to someone else. Younger children also need help in recognizing when friends are not acting like friends, but more like frenemies. Teach your child to communicate, set healthy boundaries and stand strong for what is right are crucial to success in life. The earlier these habits begin, the deeper they will be ingrained. Everything takes practice. Even courage and kindness. Set the standards early. By providing a supportive environment at home where your children can talk to you about anything, you will empower them to be comfortable with themselves in any situation. Having a strong core foundation is the best defense against any kind of bullying. Happy parenting! For more on bullying, check out Signe Whitson at www.signewhitson.com. Special thanks to Tivoli Skye. We are rooting for you!